Today I bring you the exciting notion of dessert for one: a solitary dessert journey that you share with no one, because frankly it’s none of their business. I’m probably not the first one to bring you this notion, but I am in fact the first one to do so in this particular post. Like this small accomplishment, dessert for one is a small victory over apathy in your life. If you’ve heard all this talk about eating unprocessed foods and are trying to improve your life from this angle, peaches and mascarpone are definitely a good way to go. Treat yourself to a creamy, melty, mas-car-PON-ay few moments no matter what kind of day you’re having for a nice, relaxing “ahhh…” (sigh, not scream). You didn’t just devour a sleeve of Oreos yet again in your rush to kill a craving and return to the Internet. You made magic. Jen Cantin graduated from Clark University in 2011 with a degree in English and Journalism. She moved to Philadelphia where she writes at home from the same couch that was in her old apartment. Deep Fried Epiphany is among this content. She dedicates this post to Peaches, that vile performer or whatever it is she does. In a small bowl, combine mascarpone, maple syrup and vanilla extract. Spread mixture on freshly toasted bread. Arrange peach slices as desired over mascarpone mixture. Sprinkle sugar over the top. 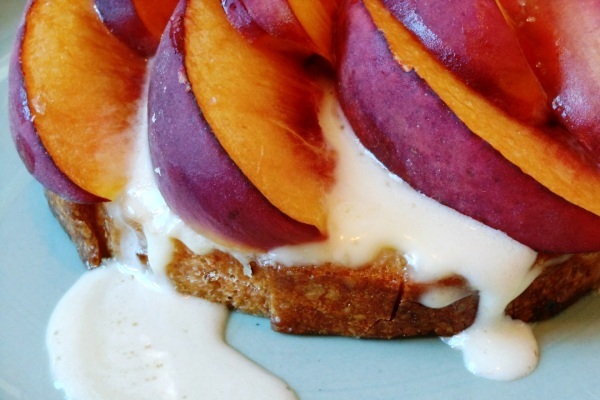 Broil for about 5 minutes or until peaches are warmed through and mascarpone begins to melt. Devour. I feel like making one right now!